*DYS 19 is also known as DYS 394. @Markers 385a&b, 439, 458, 459a&b, 449, and the 464 series are thought to mutate at a faster rate than the other markers. A difference at those markers therefore carries slightly less weight than a difference at one of the ^"slow" mutating markers. Abner Robbins, 1758-1848, of Yarmouth, Mass. * Haplogroups in green have been confirmed by SNP testing. Haplogroups in red have been predicted by Family Tree DNA based on unambiguous results in the individual's personal page. **A value of “0” for any marker indicates that the lab reported a null value or no result for this marker. All cases of this nature are retested multiple times by the lab to confirm their accuracy. Mutations causing null values are infrequent, but are passed on to offspring just like other mutations, so related male lineages such as a father and son would likely share any null values. There are currently 21 matches in this group. 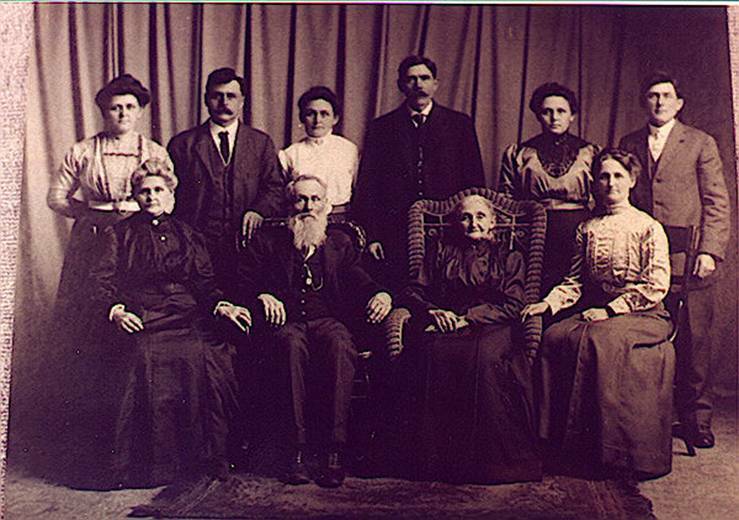 Research is ongoing to connect all these individuals to the Scottish immigrant Daniel Robins (Robinson) and wife Hope Potter. Daniel died in 1714 in Hunterdon, Monmouth Co., NJ. His immediate family is well documented but some of his children's families have sketchy records. While some descendants remained in the New Jersey area, migration patterns reflect movement through Pennsylvania, Frederick Co., VA, Randolph (now Rowan) Co., NC; Randolph Co., IL; Ohio, Tennessee; Kentucky and Missouri. Kit # 82203 descends from Daniel and Hope through their son Benjamin, his son Richard (1724 NJ-1785 Prince Edward Island), his son Benjamin (1760 NJ-1837 OH) co-founder in 1796 of Centerville, OH; his son Richard (1784 NJ-1837 OH) and his son Samuel L. (1829 OH-1910 OH). Variations in markers from this sample are colored in blue on the other test results. Daniel M. Robbins. His Civil War records and pension file say he was born in Jefferson County Ohio in 1823. He died June 1887 in Pierce County Wisconsin and is buried in the TrimBelle cemetery there. A marriage license for Daniel M. filed with Pierce County in May, 1879 lists his parents as Daniel and Margaret Robbins. Kit # 73506 . Kit # 92387 has a paper trail to Ephraim Robbins who settled in Fayette Co., PA from NJ c 1807. He has an oral history relating Ephraim to Daniel and Hope. He is one marker off on his 12 marker test, however - the marker that doesn't match is the least stable marker in that 12 marker panel. Kit 35619 has a paper trail connecting him to kit 24430 through Elmer Robbins and Sarah Owens. Elmer's mother was Rhoda Robbins, unknown father. Rhoda Robbins' parents were Joshua Robbins and Mary Brown, Joshua's father might have been Daniel Robbins. The exact match here indicates the unknown father might have been a Daniel Robbins/Hope Potter descendant, although since no surname is available this kit's results are inconclusive. There are numerous 12/12 matches with different surnames. Kit # 60549's oldest ancestor is William Robbins b1815 Edgecomb Co NC d 3/28/1893 White co, TN. These two kits are an exact match on 37 of 37 markers, which means that there is a 50% probability that the MRCA was no longer than 2-3 generations back, a 90% probability that the MRCA was no longer than 5 generations back, and a 95% probability that the MRCA was no longer than 7 generations back. Kit # 34435's oldest ancestor is Thomas Robbins, b.c.1775, Edgecombe Co., NC. His results match on 10 of 12 markers with the other two kits. This means that there is a 50% probability that the MRCA was no longer than 16.5 generations back, a 90% probability that the MRCA was no longer than 56 generations back, and a 95% probability that the MRCA was no longer than 72 generations back. Kit # 78842's oldest ancestor, John Robins born circa 1720 has links to Orange Co., VA and Wilkes Co., NC. His addition to the group adds Orange Co. VA to the mix and a possible common ancestor for the other three members of this group. Kits 36044, 7517, 24663 are an exact match on 12 of 12 markers. This means that there is a 50% probability that the MRCA (Most Recent Common Ancestor) was no longer than 7 generations ago; a 90% probability that the MRCA was no longer than 23 generations ago, and a 95% probability that the MRCA was no longer than 29 generations back. Kit 72563 matches 11 of 12 and the oldest known ancestor is unknown at this time. This means that there is a 50% probability that the MRCA was no longer than 17 generations back, a 90% probability that the MRCA was no longer than 39 generations back, and a 95% probability that the MRCA was no longer than 47 generations back. Oldest known ancestor of 36044 is Job Robbins, born 1769 in Masonville, Rensselaer Co., NY. Oldest known ancestor of 24663 is Benjamin (b. 1796) and Sarah Bailey Robbins, VT; Jersey Township, Steuben County (now Tyrone Twp. Schuyler County) NY; Jennings County, Indiana 1836-1857. Oldest known ancestor of 7517 is John Robbins born 9/1/1792 VA married Susan Risinger March 3/1810 Jefferson Co. KY settled in Knox Co., Indiana. Kit 72563 matched 11 of 12 markers, but when the markers were expanded, he was eliminated from this group. Kit 24632's oldest ancestor is George Robbins, ?-1689, Chelmsford, Mass. Kit 53060 is also a descendant of George Robbins through another son. They were a perfect match on the first 12 markers, only 1 variation in 13-25 markers and one additional variation in 26 - 37 markers. Both independently traced their Robbins ancestry back to George Robbins. The DNA results have validated both men's research back to George Robbins and indicates that there is a 50% probability that the MRCA was no longer than 6 generations back, a 90% probability that the MRCA was no longer than 12 generations back, and a 95% probability that the MRCA was no longer than 14 generations back. Kit 24558's oldest ancestor is "John the Elder" Robbins, who died at sea. He was accompanied by his son "John the Younger", to Va. on the ship "Margaret and John", who settled in Elizabeth City, Co. and later Gloucester Co. Va., from Buckby, England in 1622. Kit 33788's oldest ancestor is John Robbins, b 1808 SC; resided Overton Co., TN and has an 11/12 match with sample 24558. Kit 60287's oldest ancestor is John Robbins, and has an 11/12 match with sample 24558 & 33788. Kit 56969's oldest ancestor is Nathaniel Clark Robbins born TN circa 1807. He married Ede W. Phillips at Lexington, Henderson Co., TN, on 20 Dec 1838.Nathaniel died circa 1893 in TN. There is a 10 of 12 match to Kit 47003, whose oldest ancestor is unknown at this time. Kits 35682 & 35221 match on 10 of 12 markers. This means that there is a 50% probability that the MRCA was no longer than 16.5 generations back, a 90% probability that the MRCA was no longer than 56 generations back, and a 95% probability that the MRCA was no longer than 72 generations back. Not a close match to be sure but there is a common ancestor. This is a perplexing but fascinating puzzle. Both men, Robbins descendants, have a well documented paper trail back to Richard, son of Daniel & Hope Potter Robbins (Family Group #1). Yet their DNA does not match. More descendants are testing to see where the difference might have occured. The following kits have not been assigned to a family group yet. The fact that they don't match any of the above kits defines their research by eliminating the need to follow those lines. Kit 24430's oldest ancestor is Daniel Robbins of Carolina, descendants settled in Kentucky. Kit 35221's oldest ancestor is John Robbins (mid-1600's) of Cape Cod as documented by H.N.Latey. Kit 34787's oldest known ancestor is Marcus Lorenzo Robbins (1808-1898). He believes that Jotham Robbins of Lancaster, Ma. born 1774, who married Sarah Godfrey in 1796 and died in Lockport, NY is the father of Marcus, but lacks proof. Kit 35097's oldest ancestor is Thomas Robbins Sr. (1675 - ? ), whose descendants migrated from North Carolina to Alabama in the early 1800's, and then from Alabama to Texas in the 1850's, with one descendant - Joel Dial Robbins, and his sister who remained in Arkansas. Kit 42239's oldest ancestor is James Riley Robbins 1852-1908 KY > Moultrie Co, IL. Kit 43855's oldest ancestor is unknown at this time. Kit 72563's oldest ancestor is unknown at this time.